The Duplo DF-970 Automatic Paper Folder is one of Duplo’s quietest tabletop folding machines. With a high speed of up to 242 sheets per minute, the DF-970 utilizes Duplo’s patented three-roller friction feed system to process a wide range of paper stocks. Easy to use and built-in with sound absorbers for quiet operation, the DF-970 eliminates folding by hand and is perfect for any office environment. 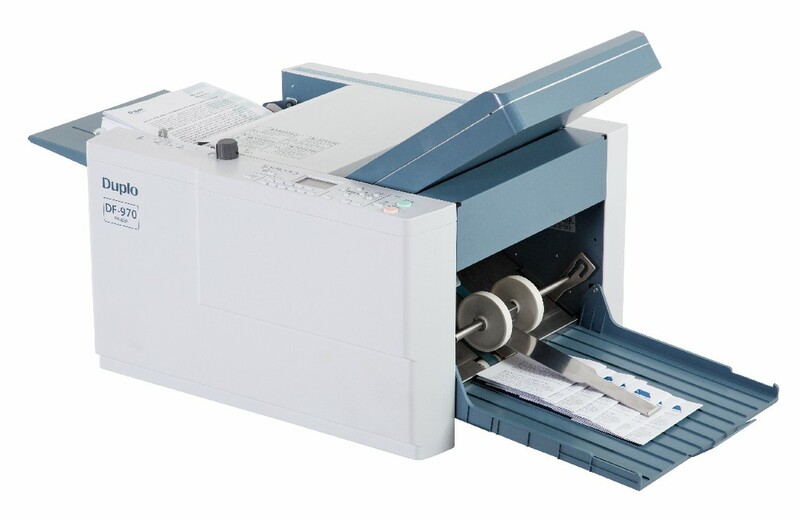 The DF-970 comes pre-programmed with six standard fold types including single, double, half accordion, letter, accordion and gate – enabling users to fold a variety of applications at the touch of a button. Using the user-friendly control panel, operators can easily select from one of the standard paper sizes and can also create custom fold styles with non-standard paper sizes simply by moving the fold plates. Custom folds can be saved into one of its 10 job memories. To further extend its capabilities, the DF-970 comes standard with a cross folding unit to reprocess single folded sheets into right angle folds.